Just after graduate school, writer Mimi Lok worked on a project that validated her belief in the power of storytelling. 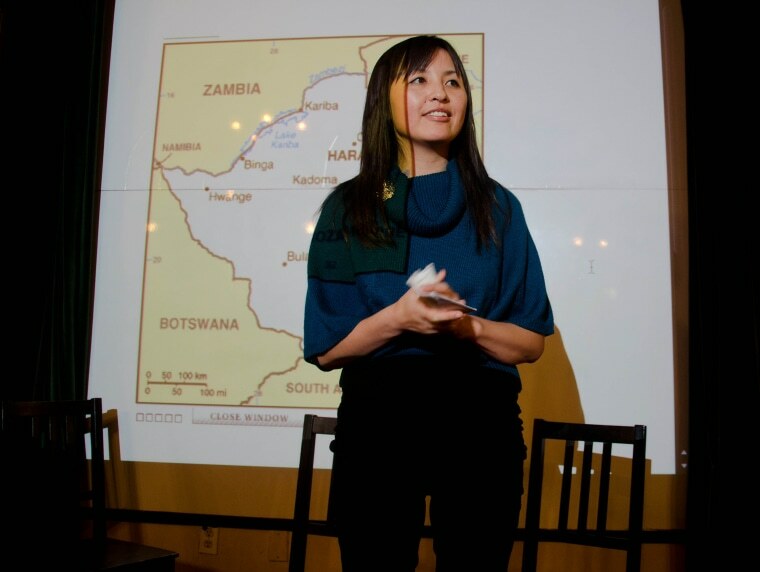 A volunteer researcher and interviewer for an anthology called “Underground America: Narratives of Undocumented Lives,” Lok collected the stories of refugees. “It was one of the most rewarding experiences of my life, and was a chance, at last, to really ‘go deep’ with people’s stories in a way I couldn’t before,” Lok told NBC News. The project was transformative for her subjects as well, she said, recalling a 2008 reading after the collection was published. Lok gave a copy of the book to one of its narrators, Roberto. Without looking at the cover, he immediately tucked it inside his jacket. Since that day, Lok has become the executive director of Voice of Witness (VOW), the organization that published “Underground America.” An 8-year-old group, VOW works to lift up unheard stories and amplify voices. Lok believes in the transformative power of these stories. Born in the United Kingdom to parents who had emigrated from Hong Kong, Lok and her siblings were raised in Epping, a small town outside of London. Her father worked in restaurants and in a glass recycling factory, while her mother was a garment worker doing piece work for high street fashion brands, with Lok and her sisters sometimes helping out, she said. Lok was engrossed with the stories her mother told her about life in the Chinese countryside. “I grew up listening to my mother’s stories about life in Guangzhou and Hong Kong. What it was like to grow up in — and escape from — a patriarchal farming community, where the lack of position and opportunity for girls and women was a given,” Lok said. She remembers pulling out a tape recorder as a child to capture her mother’s story. She also remembers playing a game where she served as editor and her younger sister as writer and illustrator for a popular music magazine. It was during a post-university trip to Hong Kong, in 1997, during the “handover” of Hong Kong sovereignty from the United Kingdom to China, when Lok became immersed in journalism. “It was my first time in Hong Kong since visiting there as a kid and listening to all of these personal stories and viewpoints was a unique, eye-opening way to get a deeper understanding of the place and of that significant moment in its history,” Lok said. Her journey as a writer led her to pursue a master’s of fine arts degree in creative writing from San Francisco State University. It was in 2007, upon completing graduate school, that Lok began volunteering as an interviewer with Voice of Witness, which was then a book series started by author Dave Eggers and physician Lola Vollen. VOW’s founders wanted to grow the project’s scope but contended with limited resources. In 2009, Lok came on board as executive director. “I started building infrastructure and systems, raised funds, transitioned the project to nonprofit status, and launched an education program,” she said. Since then, VOW’s staff has grown from one to six, and the organization has published 16 books. Lok said the core principles of VOW’s oral history methodology are rooted in empathy and equity, and she noted the importance of narratives that complicate thinking. “Stories that challenge assumptions, that foster curiosity, doubt, and dialogue, are key to what makes us engaged and thoughtful human beings, and as a consequence, better informed, effective advocates for human rights,” she said. VOW’s book series of interviews cover a myriad of complex global and domestic issues, including “Nowhere To Be Home: Narratives from Survivors of Burma’s Military Regime,” “Patriot Acts: Narratives of Post-9/11 Injustice,” “Invisible Hands: Voices from the Global Economy,” and “Surviving Justice: America’s Wrongfully Convicted and Exonerated.” At the heart of these interviews are the story’s narrator and its reader. In the interview, Bah recounts how her house was raided by the FBI and she was put into detention under suspicion of being a suicide bomber. In addition to being used alongside curriculums in schools, the book series has also been used by experts to help advocate for and raise awareness around human rights issues. “Human rights and civil rights lawyers have told us that they regard our work — the narratives and the methodology behind them — as important resources for their work,” Lok noted. Lok added that the transformational impact of the stories is felt not just by their readers, but also by their storytellers. “The process of telling your story, in your own words, and having control over how that story is shared with the world, helps to restore a sense of agency, of dignity,” she said. VOW’s book series celebrated its 10th year in 2015, the organization turns 10 in 2019, and Lok and her team continue to grow VOW’s scope and reach. In 2015, they launched the VOW Story Lab to incubate more books in their series. Meanwhile, this May they releaseed “Chasing the Harvest: Migrant Workers in California Agriculture” and “Lavil: Life, Love, and Death in Port-au-Prince, Haiti.” In June, they’re scheduled to conduct an oral history training at the Asian Art Museum in San Francisco in hopes of empowering more people to document the stories in their families and communities. “I believe anyone can and should do this kind of oral history as a way to better understand the world and their role in it,” Lok said. Kavita Das worked in the social change sector for fifteen years on issues ranging from homelessness, to public health disparities, to racial justice. She now focuses on writing about cross-cultural issues and social change. Her work has been published in xoJane, The Margins, The Feminist Wire, Quartz, The Aerogram, The Rumpus, and Colorlines. Kavita lives in her hometown of New York City with her husband and their beloved hound and resides in the Twitterverse @kavitamix.